In just a few weeks, we’ll be hosting our sixth Annual 12 Nights of Chocolate! Each year, Dandelion Chocolate invites chefs to take over our factory to create a unique holiday culinary experience for charity. This year we have 38 chefs participating, and there’s only one rule: use Dandelion chocolate on the plate. Each evening is unique in that we ask chefs to create a menu that is entirely their creation – from elegant seven-course dinners to chocolate beer, concretes and burgers! All proceeds from the event go to the SF-Marin Food Bank. In 2017, we helped to raise over 65,000 meals. The dates are December 2nd through 13th, and we’ll be hosting all of the nights, with exception of movie night, in a beautiful loft space on the second floor of our soon to open chocolate factory on 16th and Alabama Street. Our annual Willy Wonka movie night will take place at our Valencia café. Donation bins will be located inside our cafe on Valencia Street as well as the event space for the duration of the event. Stop by to drop off cans and non-perishable food anytime during the holiday series. 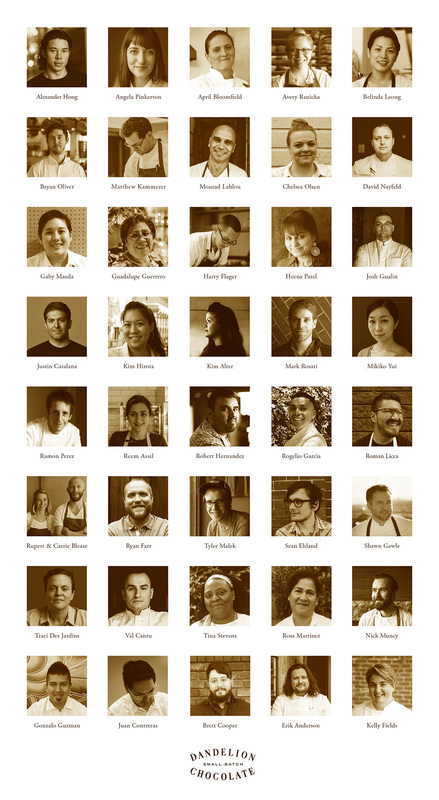 For the amazing chef line-up and tickets click here. ← The 2018 Advent Calendar is Here! Despite getting your regular newsletter and constantly checking the events page, I have missed out again on the sit-down meals for 12 Nights of Chocolate. How did the other people find out about this beforehand? Can i be on a waitlist if someone cancels and asks for a refund? Please let me know how to get the earliest notice so I don’t miss out next year.